You must be a member of the Milan Authentic Group to attend this activity. Would you like to join this group? I am finally back to reality, was a long recovery but here we go we new events tailored for the Milano Authentic pals. How about a Sunday at Protected content enjoying amenities, food and music? Wunder Mrkt returns to Protected content Milano, in the center of the Tortona district. A free event, and wonder market full of fascinating objects ready to tickle you, corners where you can chat, listen to music and eat. 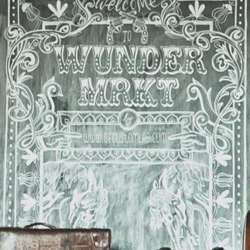 WUNDER stands for discovering new things, meeting people, enjoying good food, drinking a beer, enjoying music and having fun even participating to workshops in a magical space that will surprise you with an exceptional setting . MARKET as the place where you can buy bizarre objects, craft creations, vintage, unique pieces, vinyls, design objects, modern art, art. Over Protected content selected exhibitors awaiting. The event starts officially at 11:30 and end at 20:30, I tried to be polite and thought it would be a nice thing to visit it in the afternoon without forcing you to an early wake up call. But if you want me to change it to earlier, post comments and I adapt to your needs.